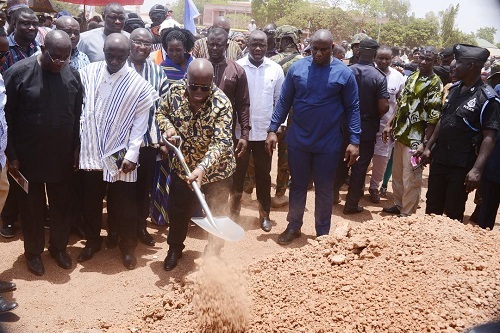 President Nana Addo Dankwa Akufo-Addo has cut the sod for construction of the Tamale Interchange to mark the start of work under the US$2billion infrastructure for bauxite barter arrangement with Sinohydro Corporation Company of China. The one-kilometre Tamale Interchange will link the Kumasi road through the Point 7 road, the Central Taxi Rank, Central Market intersection with the Melcom Road and Bolgatanga Road. The project, which is under the Master Project Support Agreement (MPSA) between the government of Ghana (GOG) and the Sinohydro Corporation Company of China, is to open up various communities and boost socio-economic growth. The projects are to be completed within 30 months. A total of 442 kilometres of roads will be constructed under the first phase of the agreement at a cost of US$646million. This will include the construction of an 84km Accra inner-city road network; 100km Kumasi inner city road network; 39km of Sunyani and Berekum inner-city roads; 32 km of Cape Coast and Prestea inner-city roads; 66km of Hohoe and Jasikan roads; rehabilitating 38km of the Akyem-Oda Asafo-Ofoase road; as well as upgrading selected feeder-roads in Kumasi and the Western Region. An additional 1,300 kilometres of roads, three interchanges and 69 steel bridges will be constructed at an estimated US$850million under phase-two of the agreement. Speaking at the sod-cutting in Tamale, President Akufo-Addo said US$1.5million out of the amount has been allocated for the construction of roads in the country, while US$500million has been earmarked for infrastructure. “Ghana will witness a dramatic and very welcome change to our infrastructure, especially in the road sector. These arrangements are from the strong, positive relationship between Ghana’s government and the People’s Republic of China,” he said. He said steps have been taken to ensure full exploitation of the entire value-chain of the country’s bauxite deposits. “This necessitated establishment of the Ghana Interchange Emolument Development and Statutory Corporation to oversee development of the full value chain of our bauxite resources for a vibrant aluminum industry in Ghana, and ensure we live up to our barter transaction. “This innovative arrangement, the first of its kind on the continent, is to ensure the extension of electricity to rural areas; construction of residential buildings for the judicial service; enough courts in the country; land fill sites and industrial parks to enhance development in the country, he added,” he said. He stressed that in order to ensure smooth implementation of the project, project risk management and implementation teams have been formed from various stakeholder organisations and project partners to supervise the project to ensure value for money. Mr. Kwasi Amoako- Atta, Minister of Roads and Highways said government was committed to improving the infrastructure and the road networks of the country to enhance business activities and create jobs for the youth. He said it is historic because it is the first time an interchange will be put up in the Northern sector of the country. “The overall objective of the project is to ensure regional and national traffic flow, and also to enhance trade and strengthen region economic integration as well as reduce cost of doing business in Ghana by end of the ten projects earmarked for development,” he said. The Sagnerigu Naa, Ambassador Yakubu Abduali who spoke for Yaa Naa Abubakari Mahama II, commended government for the initiative, saying the project will help create job opportunities for the youth. He assured of the chiefs and people of Dagbon’s support for construction of the project to enhance economic activities. The international agreement that will see Ghana and China trade bauxite in exchange for infrastructure worth US$2billion received the approval of Parliament. This followed adoption and approval of the report by the Finance Committee on the Master Project Support Agreement (MPSA) between the government of the Republic of Ghana and Sinohydro Corporation Limited for an amount up to US$2billion for the construction of priority infrastructure projects. The deal, which is in the form of barter, will enable Ghana to raise US$2billion from China’s Sinohydro Corporation Limited to undertake various infrastructure projects aimed at bridging the country’s infrastructure deficit, estimated at US$30billion. Sinohydro Corporation Limited will in turn receive refined bauxite in the form of alumina or aluminum over a fifteen-year (15-year) period (inclusive of a three-year grace period) from the Republic of Ghana. Per the deal, thus the Master Project Support Agreement, government through the Ghana Integrated Bauxite and Alumina Development Authority (GIBADA) will establish a bauxite processing plant to process the raw bauxite into alumina before shipping same to service its obligations to Sinohydro Corporation Limited’s strategic partner (Offtaker).